Abstract—This paper proposes an in-depth statistical exploration of the available hydraulic head data concerning the Ressacada aquifer (Florianopolis, Brazil). By means of this approach, the study aims to obtain a complete picture of the natural drainage in the domain. This intent supports the understanding of the relationship between rainfalls and aquifer level fluctuations in this coastal region. In a broader perspective, the drainage term can be used in the application of the water table fluctuation method, in order to explain the seepage behavior and recharge phenomena. The chosen study area was a shallow coastal aquifer surrounded by mangrove swamp in a humid subtropical climate region. In view of the cited features, it represented a complex domain to assess both groundwater and surface processes. Besides, the co-occurrence of numerous anthropogenic factors, and the presence of strategic interest areas (International Airport, Military base camp), have further complicated the vertical infiltration and the natural drainage. Finally, results showed two main groups of piezometers with a typical drainage behavior. It seems to depend on the well position in the flow field and, therefore, on the distance from surface receptors. In each group, two distinct drainage conditions were also detached in terms of the water table level. Index Terms—Natural drainage, spatial analysis, coastal aquifer, water table fluctuation method. Fabrizio Rama is with the Núcleo Ressacada de pesquisa em meio ambiente (REMA), Department of Environmental Engineering, Federal University of Santa Catarina (UFSC), Florianopolis, SC, 88040-900 Brazil (e-mail: fabrizio.rama@posgrad.ufsc.br). Davide Franco is with Laboratório de Hidráulica Marítima (LAHIMAR), Department of Environmental Engineering (UFSC), Brazil (e-mail: franco@ens.ufsc.br). Henry X. Corseuil is with Núcleo Ressacada de pesquisa em meio ambiente (REMA), Department of Environmental Engineering (UFSC), Brazil (e-mail: henry.corseuil@ufsc.br). 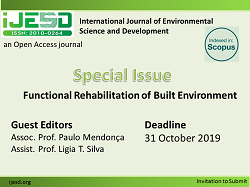 Cite: Fabrizio Rama, Davide Franco, and Henry X. Corseuil, "Spatial and Temporal Analysis of Natural Drainage in the Ressacada Aquifer (Florianopolis, Brazil)," International Journal of Environmental Science and Development vol. 8, no. 9, pp. 653-660, 2017.